January 2019: We’re very proud to announce that the latest TMFS Feature Documentary, ‘Sea of Shadows’, just had its sold out world premiere at the 2019 Sundance Film Festival in Park City, Utah. The event took place in attendance of CEO of TMFS Walter Köhler and members of the film production team, as well as honoured guests, activists and scientists, that were featured in the film. 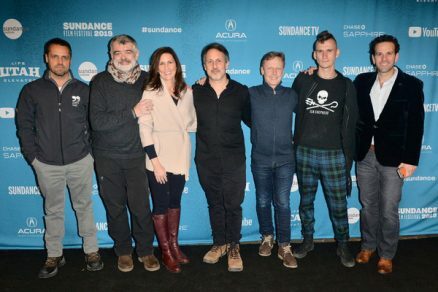 (L-R) Andrea Crosta, Walter Kohler, Cynthia Smith, Richard Ladkani, Wolfgang Knopfler, Jack Hutton, and Carlos Loret de Mola attend the ‘Sea Of Shadows’ Premiere during the 2019 Sundance Film Festival at Prospector Square Theatre on January 27, 2019 in Park City, Utah. ‘Sea of Shadows’ is a riveting new documentary with the intensity of a Hollywood thriller. A looming disaster in one of the most spectacular environments on Earth sparks a rescue mission like no other. When Mexican drug cartels and Chinese traffickers join forces to poach the rare totoaba fish in the Sea of Cortez, their deadly methods threaten to destroy virtually all marine life in the region, including the most elusive and endangered whale species on Earth known as the vaquita porpoise. But a team of brilliant scientists, high-tech conservationists, investigative journalists and courageous undercover agents as well as the Mexican Navy put their lives on the line to save the last remaining vaquita and bring the vicious international crime syndicate to justice.